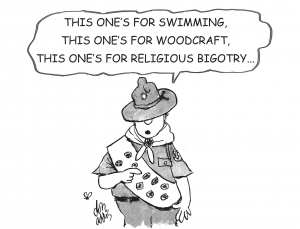 MADISON– A national atheist lobbyist group has launched a newspaper advertisement campaign to pressure the Boy Scouts of America into welcoming secular students to its ranks. On Sunday, the Wisconsin-based Freedom from Religion Foundation (FFRF) published a prominent advertisement in the New York Times. The quarter-page ad urged BSA remove a reference to God in its membership form, opining it “defames freethinkers.” Additionally, the ad blasted the organization for including “duty to God” in its Scout Oath. In addition to the campaign in the New York Times, FFRF has purchased space in several other newspapers across the country to spread its message. The ad will run in Alabama’s Huntsville Times later this week, and in approximately a dozen other newspapers next month. Rob Schwarzwalder, vice president of Family Research Council, told reporters that BSA’s decision to admit homosexual members effectively cleared the path for further compromise and policy renunciation. Thus, Shwarzwalder believes that FFRF is right in questioning BSA’s religious policy. The general public has weighed in on the issue as well. One commenter suggested that atheists shouldn’t meddle with BSA in the first place.